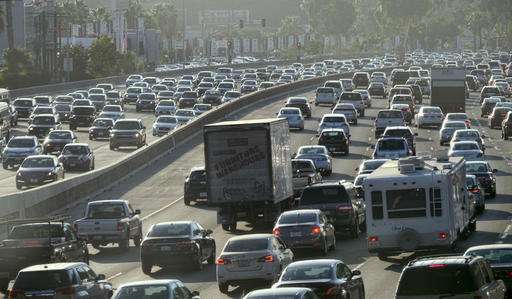 All those cars on California's famously gridlocked highways could be doing more than just using energy - they could be producing it. "Hearing these details for the first time —obviously, they're not heartening," Gatto said. "I don't want anything to be colored by one tiny experiment by one company in a different country." Solar Freaking Roadways!! Errr, no - if it's gridlock, cars would be covering the solar cells and yeah, traffic would pound those cells to rubble in short order. Piezoelectric Roadways!! Errr, if the traffic is gridlocked, then there's not much movement to generate power, is there?? Seriously, this feels like it is harvesting energy from the passing cars - that seems like theft unless the loss to the cars would have happened anyway, the piezoelectrics just harvest what would otherwise have been wasted. Seems less ridiculous than solar roadways, so go for it. Try it and let us know if it is practical. Why doesn't California harness another resource they have, an abundance of B and C list celebrities? They could act as celebrity coaches at special spin centers where the exercise bikes are fitted with generators. Hundreds or even thousands would show show up and generate electricity while listening to the likes of Kim Kardashian talk about her personal life! Piezoelectric Roadways!! Errr, if the traffic is gridlocked, then there's not much movement to generate power, is there?? piezoelectric roads have got to generate more tire rolling friction. The energy has got to come from somewhere. This means that the electricity is generated by wasting more gas. Nothing is free. These promotors are trying to pull a fast one over the public. Well it is good to see that someone's brother-in-law is getting a nice grant. This is the dumbest thing I've seen yet, it will require cars to burn more gasoline to inefficiently generate some more energy. How is burning fossil fuels inefficiently green? And it's no more renewable than the gasoline that is powering the vehicles. Why would it REQUIRE the vehicle to burn more gas? The point is that there is lost energy in the form of vibrations and movement on the pavement. The idea is to harness that waste. I dont have a clue where you people are getting the idea that MORE energy has to be created for this to work. Seriously, for people who are visiting a science site, it seems like so many of you damn people are naysayers where every new idea is a bad one. I find it mind boggling. That's because it is. The harvesting is bought at the cost of having the surface give (the piezocrystals must be compressed and then must decompress to their original state after the car has passed). Essentially They're building a road made of rubber. That cars don't get the same gas mileage on a rubber road than they do on a concrete one should be fairly obvious. The energy that is harvested isn't 'free'. The cars will give it up (using more gas) and the transmission losses (heating of a 'soft' surface) will even mean that cars will use up *even more* gas in addition than you get out of the system. Of course the beauty is that drivers pay, while the state gets to sell the electricity. Read: It's a tax. Now as for the "solar road" idea: When this came up a couple years back I thought it was a terrible idea. And I still think it is unless this can be incorporate into roads automatically and at next to no cost without adding maintenance or shortening longevity of the road covering. A tall order to say the least. At a cost of 3.7 million dollars it has returned enough energy to earn it just over 2500 dollars in Netherland's electricity prices. I.e. to make this economically viable over a 20 year lifespan the cost has to come down by a factor of 50 - at least. I don't see this happening in the near future. ""No longer is driving just the act of using energy. Maybe it's also part of the process of generating it," said Paul Bunje, a scientist at a Los Angeles-based nonprofit that funds technological developments and the former founding director of UCLA's Center for Climate Change Solutions." It is stupid statements like that which cast a cloud of doubt over all of climate science. The fact that he was a director makes it even worse. Ah...Climate Change...the cash cow that just keeps on giving. If the in road devices take energy from the road - car interface it can only come from the car's petrol tank. That is theft. More airy-fairy stuff from the Calikook libs. How's that $65 billion train coming that no one will use and will cost more than airfare to travel in?